A three-tier farm configuration consists of two front-end web servers, an application server, and a database server. The deployment sequence and configurations that are described in this article are based on recommended best practices. While the farm configuration is not complex, it provides a fundamental infrastructure to implement a SharePoint 2013 solution on similar or more complex farms. This topology is typically used for the medium and large farms described in Overview of SharePoint 2013 installation and configuration. In terms of performance, capacity, and scalability, a three-tier topology is recommended over a two-tier topology. A three-tier topology provides the most efficient physical and logical layout to support scaling out or scaling up, and it provides better distribution of services across the member servers of the farm. The following illustration shows the three-tier deployment that is described in this article. You can add web servers to the web tier. These servers can be configured as conventional web servers to handle user requests, or they can be configured to host dedicated query components or other service components. You can add farm servers to the application tier and configure them as dedicated servers that will host the SharePoint Central Administration website or other services on the farm that require dedicated resources or isolation from the web tier — for example, crawl components, query components, and profile pages. You can add database servers to the database tier to implement a stand-alone instance, database mirroring, or a failover cluster. To configure the farm for high availability, database mirroring or a failover cluster is required on the database tier. Hard Drive: 80GB Free Space, and depends upon amount of data need to be stored. 64-bit Windows Server 2012 Standard or Datacenter. 64-bit edition of Windows Server 2008 R2 SP1 Standard, Enterprise, or Datacenter OR Windows Server 2012 Standard or Datacenter. Before you install SharePoint 2013, you must check for and install all the prerequisites on the application server and the web servers by using the Microsoft SharePoint Products Preparation Tool. Use the following procedure to install prerequisites on each server in the farm. Verify that the user account that is performing this procedure is the Setup user account. In the folder where you downloaded the SharePoint 2013 software, locate and then run prerequisiteinstaller.exe. On the Welcome to the Microsoft SharePoint Products Preparation Tool page, click Next. Note: The preparation tool may have to restart the local server to complete the installation of some prerequisites. The installer will continue to run after the server is restarted without manual intervention. However, you will have to log on to the server again. On the License Terms for software products page, review the terms, select the I accept the terms of the License Agreement(s) check box, and then click Next. On the Installation Complete page, click Finish. The following administrative and service accounts are required for SharePoint 2013 deployment. Additional accounts and permissions may be required to fully implement all aspects of a production farm. SQL Server Service Account: This account is required to run the SQL Server database services ‘MSSQLSERVER’ and ‘SQLSERVERAGENT’. Name it something like sqlSvcAcc. Setup Administrator: This account is required to run the SharePoint setup, SharePoint Products Configuration Wizard, and install/manage SQL Server. Name it something like spAdmin. SharePoint Farm Account: This account is required for configuration and management of SharePoint. This account also acts as the default application pool identity for the SharePoint Central Administration website and run the Microsoft SharePoint Foundation Workflow Timer Service. Name it like spFarmAcc. Application Pool Account: This account is required to configure web applications in SharePoint. Name it like spAppPoolAcc. 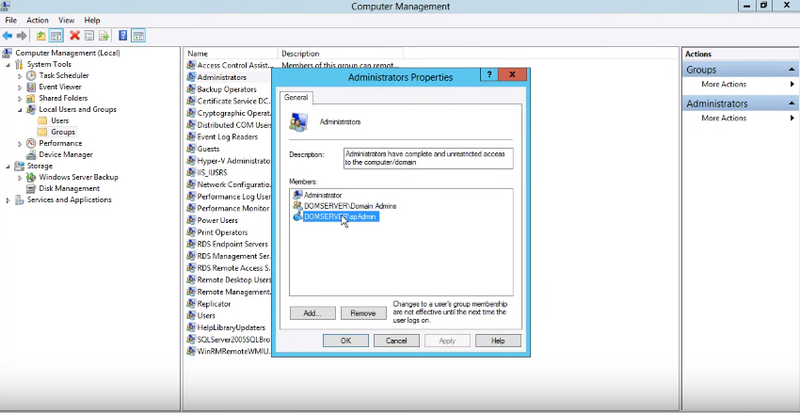 Create a new Organizational Unit in Active Directory and create the above 4 service accounts. Set their passwords to never expire and user cannot change the password. Add the SharePoint Setup Administrator account (spAdmin) to administrators group on all servers in SharePoint farm. Go to Security and then Logins. Double click domain\spAdmin Login properties windows will open up. Select ‘Server Roles’ option and select the checkboxes against ‘dbcreator’, ‘sysadmin’ and ‘securityadmin’. Run the SQL Server setup. 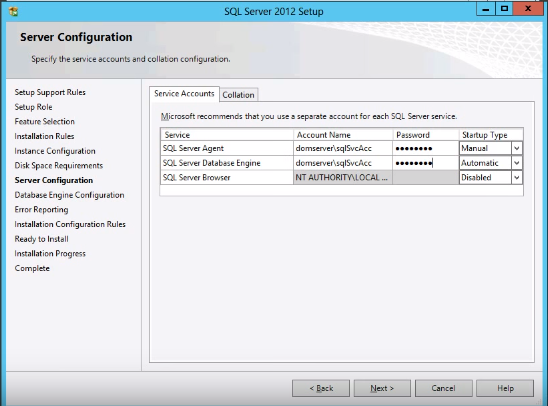 Under Server Configuration screen type the service account ‘sqlSvcAcc’ name and password for SQL Server Agent and SQL Server Database Engine services. 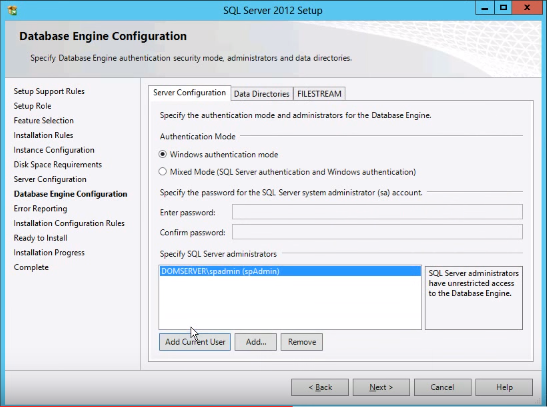 Under Database Engine Configuration, specify the ‘spAdmin’ service account as SQL Server administrator. 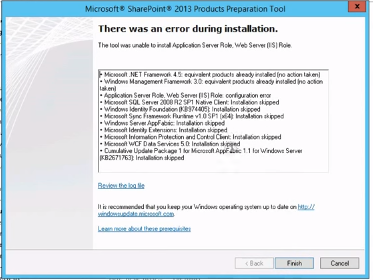 After the prerequisites are installed, follow these steps to install SharePoint 2013 on each server in the farm. The following procedure installs binaries, configures security permissions, and edits registry settings for SharePoint 2013. When the Setup program is finished, a dialog box prompts you to complete the configuration of your server. Clear the Run the SharePoint Products and Technologies Configuration Wizard now check box. For consistency of approach, it is recommend that you do not run the configuration wizard until you have installed SharePoint 2013 on all application and front-end web servers that will participate in the server farm. 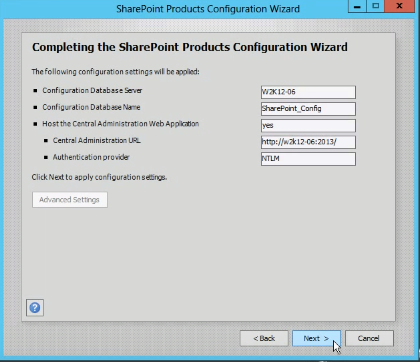 To create and configure the farm, you need to run the SharePoint Products Configuration Wizard. This wizard automates several configuration tasks, such as creating the configuration database, installing services, and creating the Central Administration website. It is recommended that you run the SharePoint Products Configuration Wizard on the server that will host the SharePoint Central Administration website before you run the wizard on the other servers in the farm. 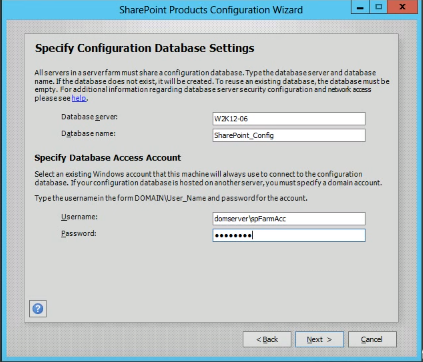 On the server that will host Central Administration (the application server), click Start, point to All Programs, and then click SharePoint 2013 Products, and then click SharePoint 2013 Products Configuration Wizard. If the User Account Control dialog box appears, click Continue. In the dialog box that notifies you that some services might have to be restarted during configuration, click Yes. On the Connect to a server farm page, click Create a new server farm, and then click Next. On the Specify Farm Security Settings page, type a passphrase, and then click Next. On the Configure SharePoint Central Administration Web Application page, configure SharePoint Central Administration Web Application. 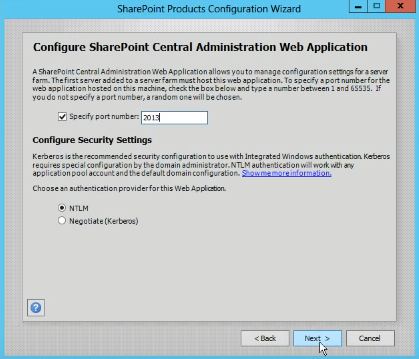 A SharePoint Central Administration Web Application allows you to manage configuration settings for a server farm. The first server added in server farm hosts this web application. You can specify a particular port number, else a random port will be chosen. The Central Administration website will open in a new browser window. Here you can create and manage your SharePoint 2013 web application (website). Troubleshooting Tip: If the SharePoint Products Configuration Wizard fails, check the log files on the drive on which SharePoint 2013 is installed, which are located in the %COMMONPROGRAMFILES%\Microsoft Shared\Web Server Extensions\15\LOGS folder. After you create the farm on the application server, you can add the servers for the web tier by following the same process described earlier in this topic for installing SharePoint 2013 on the server that hosts Central Administration. The only difference is that during setup, you are prompted to join an existing farm. Follow the wizard steps to join the farm. Configure usage and health data collection: You can configure usage and health data collection in your server farm. The system writes usage and health data to the logging folder and to the logging database. Configure diagnostic logging: You can configure diagnostic logging that might be required after initial installation or upgrade. The default settings are sufficient for most situations. Depending upon the business needs and life-cycle of the farm, you might want to change these settings. Configure incoming e-mail: You can configure incoming e-mail so that SharePoint sites accept and archive incoming e-mail. You can also configure incoming e-mail so that SharePoint sites can archive e-mail discussions as they occur, save e-mailed documents, and show e-mailed meetings on site calendars. In addition, you can configure the SharePoint Directory Management Service to provide support for e-mail distribution list creation and administration. Configure outgoing email: You can configure outgoing email so that your Simple Mail Transfer Protocol (SMTP) server sends email alerts to site users and notifications to site administrators. You can configure both the “From” email address and the “Reply” email address that appear in outgoing alerts. Configure Search settings: You can configure Search settings to crawl the content in SharePoint 2013. 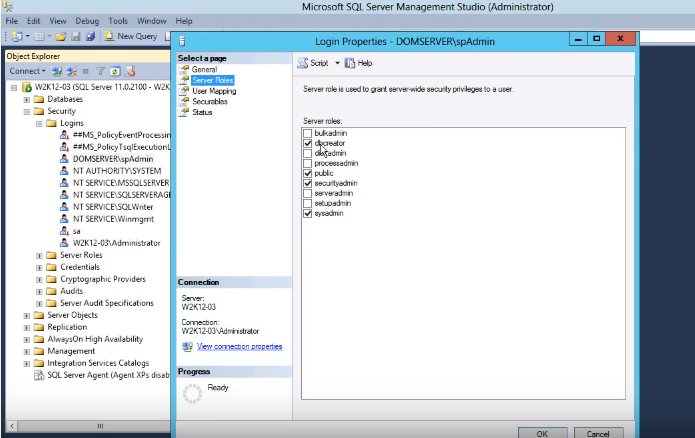 Under Server Roles screen, select the Application Server and Web Server (IIS). Under Application Server Role Services, select the Web Server Support, TCP Port Sharing, HTTP Activation, Named Pipes Activation, TCP Activation as shown below. Do not de-select any other option selected by default. If prompted, click Add Features. Click Next. Under Web Server (IIS) Role Services, select Logging Tools, Tracing, .Net Extensibility 3.5, ASP.NET 3.5, IIS 6 Management Compatibility, IIS 6 Scripting Tools. Do not de-select any other option selected by default. Click Next and click Close once installation completes.